Detox dieting and cleanses became buzzwords in health circles in the recent years and it seems their popularity is yet to dwindle. But what exactly are detox diets and what can they do for the body? Detox (detoxification) diets and cleanses claim to clean the blood and eliminate harmful toxins from the body. These are usually short-term dietary interventions that involve a period of fasting. This is followed by a strict diet of vegetables, fruits, fruit juices, and water. Some of these also include detox infusions or teas, and even supplements. What happens to the body after a cleansing diet? These detox diets are usually recommended because we are constantly exposed to toxic chemicals in our diet or the environment. These include pollutants, synthetic chemicals, and other harmful compounds. 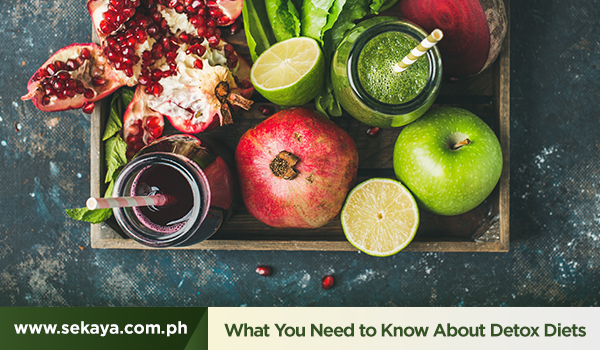 While there are few studies that strongly link detox diets and weight loss, they may help with short-term weight loss. There are also some aspects of these cleanses that are generally linked with improved health. These include eating nutritious food, drinking more water and infusions, exercising, avoiding environmental toxins, and relaxing more. Before starting any detox diet, it’s important to consider possible side effects. Severe calorie restriction can cause fatigue and irritability, and vitamin and mineral deficiencies and dehydration in the long term. The body has its own way of removing toxins so you may not even have to resort to a drastic cleansing diet. A healthier method would be simply to eat better and stay active. Another way you can boost the body’s daily detoxification process is with botanical infusions like Gentle Detox from Sekaya.